Length410 mmWeight2.1 kgMounting1X Jaw1X 28mm (1-1/8") Junior Receiver &n..
Length410 mmWeight2.1 kgMounting1 x Jaw2 x 16mm (5/8") Baby Pin &.. 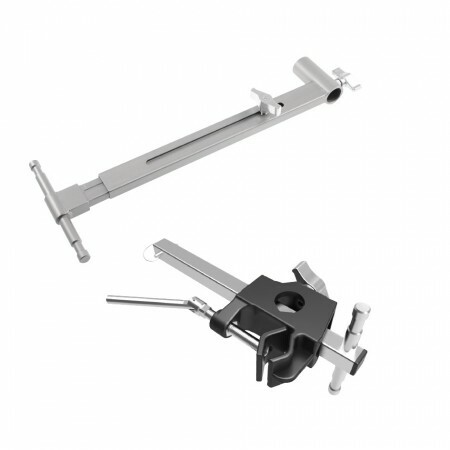 Features :360° rotatableFriction control via partial loosening handle for precise positioningCompati.. Junior Mounting:1X Ø28 mm (1/8") Pin1X Ø28 mm (1/8") ReceiverExtend from 18" to 25".. Junior Mounting:1 x Ø28 mm (1-1/8") Pin1 x Ø28 mm (1-1/8") Receiver..
Baby Mounting:2X Ø16 mm (5/8") Pin1X Ø16 mm (5/8") ReceiverExtend from 18" to 25"..
Baby Mounting:2 x Ø16 mm (5/8") Pin1 x Ø16 mm (5/8") Receiver.. Length: 25.6"Mounting: 1X 28mm (1-1/8") Junior Receiver3X 28mm (1-1/8") Junior Pin.. Length: 25.6"Mounting: 1X 16mm (5/8") Baby Receiver5X 16mm (5/8") Baby Pin..